HOW SEVERE WAS THE INCIDENT? When an insurance company analyzes how much they should pay you, one thing they look at is evidence of how serious the event was- whether it be a car crash, a trucking crash, a trip or slip and fall, or a defective product. If the event was traumatic, they will assign more value to your claim. In a car crash case, insurance companies look to the property damage of all cars involved and the speeds involved. Is this fair? No. We’ve all heard stories of people walking away from terrible car crashes completely unharmed. We’ve also heard stories of people sustaining lifelong injuries from a car crash that didn’t look severe at all. The truth is, all of us have different bodies that are more, or less, susceptible to injury during a car crash. Our bodies move differently, some of us have already existing conditions that make us more likely to be injured in a crash. Regardless, you need to know that this is something insurance companies rely upon when deciding what to pay in a car crash case. 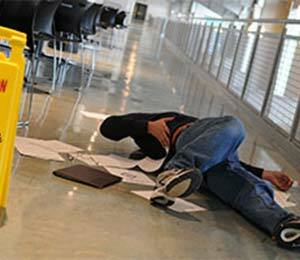 In a slip and fall case, the insurance company will want to know what you slipped on and how hard you fell. They will want to know how hard the ground was (tile, wood, dirt, marble). If the insurance company thinks you couldn’t have hit the ground very hard, they are less likely to make an offer you are happy with. The bottom line is, the insurance company will consider the severity of the incident, whether it is a car crash, a trucking crash, a defective product, or a slip and fall, when deciding how much to offer you. The insurance company will look at how bad your injuries are. If you sprained your ankle, they will offer much less than if you broke your ankle. Many folks believe they can sue a trucking company for a million dollars after a crash in which they sustained nothing more than bumps or bruises. This is obviously not true. Probably the most significant factor in determining a case’s settlement value is your injuries. In other words, your harms and losses. If you have life-changing injuries, your case value should be significantly higher than someone without such serious injuries. Your harms and losses involve your medical bills, lost wages, pain and suffering, inability to do what you did before, and any other harm or loss that you sustained. These have a direct impact on your settlement value. HOW LONG DID YOU GET MEDICAL CARE? The insurance company will also consider your length of treatment in making a settlement offer. If you treated for a very short time, they will offer you less than if you treated over a period of months or years. Of course, always keep in mind that you should not receive medical care unless you need it. It will be clear if you are trying to play the system. Follow your doctor’s orders. Do not undertreat. Do not over treat. At the end of the day, the insurance company will rifle through your medical records like a hound looking for a bone. They want to find any reason to reduce your claims value. IS YOUR INJURY PERMANENT? WILL YOU RECOVER? WHEN? The insurance company will consider whether or not you have a long-term or permanent injury. The longer you will be experiencing harm, the more they should pay you. If you will never be the same because of your injuries, do not let them jerk you around. Juries in any county will consider the long term harms caused the by the other party’s wrongdoing and the insurance company should to. DO YOU HAVE ALL THE EVIDENCE? If you have the evidence to prove that the other party is at fault and you have the evidence to prove your harms and losses, then you are in a good position to expect more from your settlement. If you don’t, you should expect less. This is because the insurance companies know that if you don’t have proof, you won’t win in a trial either. Because of that, they will not offer you as much money. The lesson: collect all evidence as soon as you can, before it is lost. An experienced attorney can help you do that. Call us if you want. This is what we do. Most people don’t realize that where you live plays a huge role in what an insurance company will offer you. Seems odd, but it is true. I meet with attorneys across the United States. One thing that I’ve seen is settlement and jury verdicts vary from state to state, and even within the counties of a state. The reason is this: An insurance company will never pay you more than what they think a jury might award you. So one of the facts in deciding a settlement is, what are the jury awards in your county? If your county is notorious for bad awards, the insurance company will not offer you as much. If your county is notorious for great awards, the insurance company will offer you more money. Finally, insurance companies know exactly which personal injury attorneys will settle for less, and which ones are willing to fight to a trial. If your attorney will file lawsuits and go to trial, he or she is likely getting better settlements. If you don’t have an attorney, this factor doesn’t apply to you of course. If you want an attorney, give us a call. We’re happy to discuss this, and anything else pertaining to your case. If we’re a good fit, we’ll represent you.